WHAT DREW ME TO THIS PALETTE? Did I need to buy another eyeshadow palette? The quick and easy answer to that question is no! However, when I saw that this was going to be an eyeshadow palette and there would be 30 neutral eyeshadows in it, I knew that I wanted this in my makeup collection. I haven't heard this being talked about as much as the Anastasia Beverly Hills Modern Renaissance palette (which I reviewed here) but I did read a couple of reviews and the blogger who 100% made me buy this was Catherine from Love Catherine. I read her review and knew that this was a palette that I needed to try for myself. 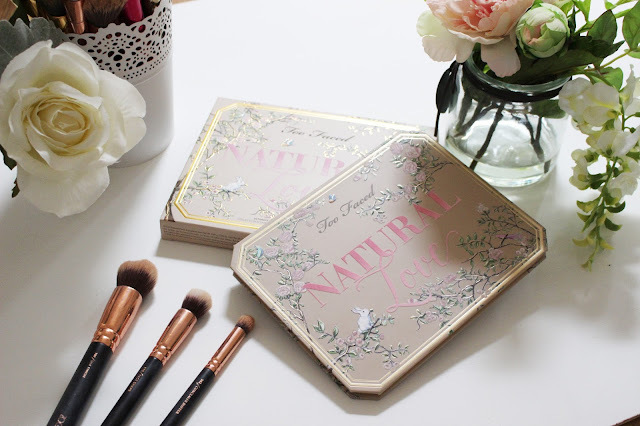 I have linked Catherine's review of the Natural Love palette and I would definitely recommend taking a look at her blog as it is amazing, especially if you love everything pink and girly! I also have been looking for a palette that I can use every single day that was full of more neutral shades and when I saw this palette I knew I needed it. 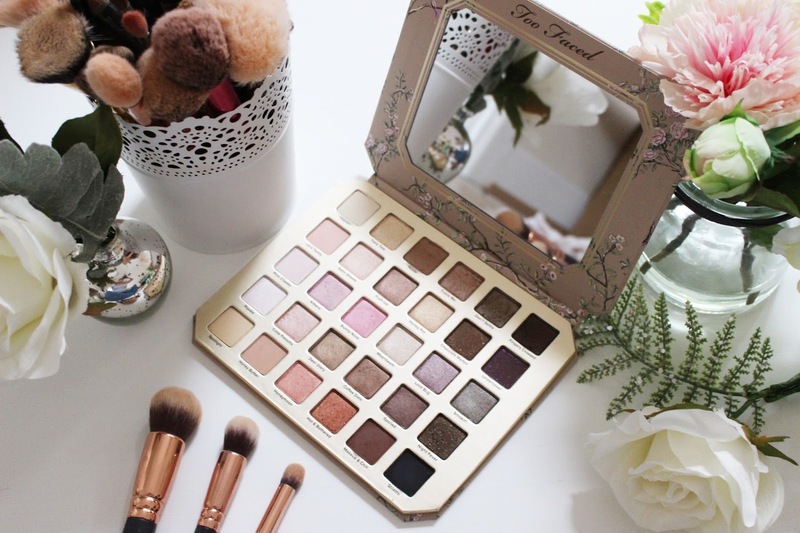 Not only do I love the formulation of my other Too Faced palettes but I loved the fact that this is full of 30 shadows that are neutral and can be worn every single day. It also reminded me of some of my Naked and other Too Faced palettes but I loved that this is a much larger palette and had some gorgeous new shades that I don't own currently. I have also wanted to try the shade Satin Sheets for some time and when I saw it was in this palette, I was so excited, as it is a beautiful champagne rose gold shimmer shade that I have heard works amazing as a highlighter shade. 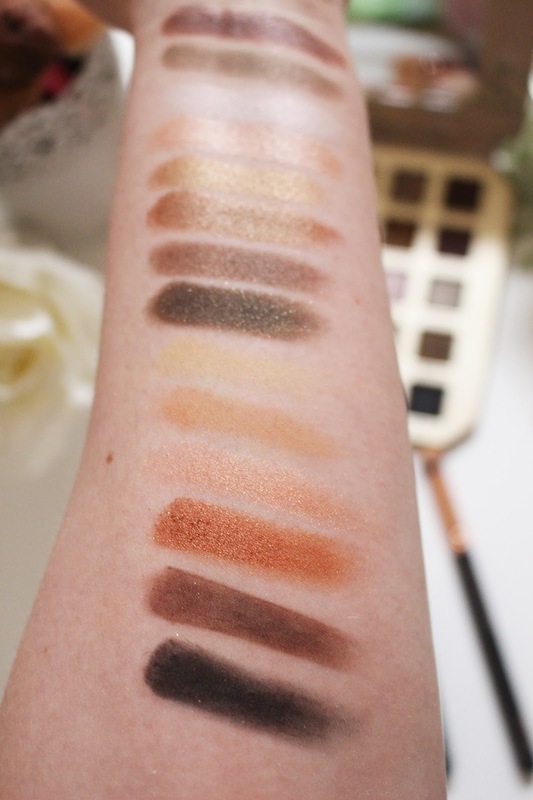 I also knew this would be a palette of wearable shades and I would wear every single eyeshadow at some point - there are no bright shades which is great for me as they are always the shadows that I never wear in my other palettes. Also this palette is great for the Spring and Summer when I prefer to go for a more natural look! WHAT I LOVE ABOUT THIS PALETTE? What can I say about this palette, except I love it! It has only been released for a little while, here in the UK, and I have not really heard that many reviews about it (except for some blogs and in some haul videos), unlike the mass hysteria that was created around the release of the Modern Renaissance palette from Anastasia Beverly Hills. But Too Faced have completely changed the whole eyeshadow game when it comes to natural eyeshadow palettes, and I would say that this palette is better than my Urban Decay Naked palettes. 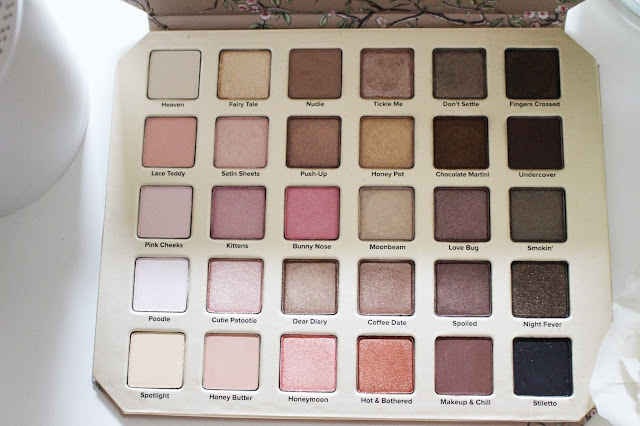 This really is the every neutral lover's dream palette! In total you get 30 gorgeous, highly pigmented and neutral eyeshadows; with 7 mattes, 13 shimmers and 10 sparker finish shadows! Can we just spend a minute admiring the packaging of this palette? Too Faced really know how to package a product - every time I walk into Debenhams and look at the counter I just want to buy everything because of the way that they have packaged the products (it does not matter whether it is a palette, bronzer or highlighter, Too Faced know how to package). They really know how to make us beauty lovers want to buy something! This palette looks like it has come straight from a fairytale book and I am just obsessed with how it looks on my dressing table. I love the fact that they have decided not to go with a tin palette for this one, as it feels more like a book and doesn't feel as heavy. If you love anything girly and cute, then this is a palette you love and need on your dressing table. The floral packaging and the cute design of bunnies and birds makes it look like something from Snow White or Cinderella. The way in which the birds, rabbit and flowers have been printed on the packaging makes it look like someone has individually drawn and painted them onto your palette - plus it looks more elegant in comparison to the bright and fun packaging of their other palettes. I also love how there is embossing and texture on the palettes which just makes the palette feel more luxurious. 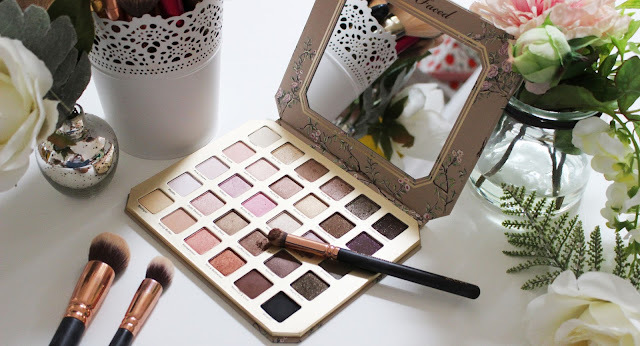 When you open the palette you are greeted with a fairly large mirror, which is perfect for seeing everything when you are applying your makeup - Too Faced do have a tendency to sometimes block off parts of the mirror with a design so it is quite difficult to use as a mirror as you have to hold the palette so closely to your face to see anything. Whereas, with this mirror you can easily have it on your dressing table and not have to hold the palette up to your face when you apply your makeup. Then on the opposite side of the mirror you get 30 of the most beautiful shadows I have ever seen and each pan is a fairly decent size. This really is a stunning palette, that definitely has a romantic feel to it - making it a great present for someone you love! The shadows themselves have been given such cute and romantic names (I have always loved the names of Too Faced shadows as they are always so original and fun) and Too Faced have really outdone themselves with these names; you have Lace Teddy, Fairy Tale, Bunny Nose, Satin Sheets, Love Bug, Honey Butter and Cutie Patootie. Aren't those names just the sweetest ever? Like I said there are 30 shadows in this palette, with a combination of some old favourites from previous palettes and a majority of new never-before-seen shades. In fact 17 of the eyeshadows ares ones that you won't see in any other Too Faced palette. 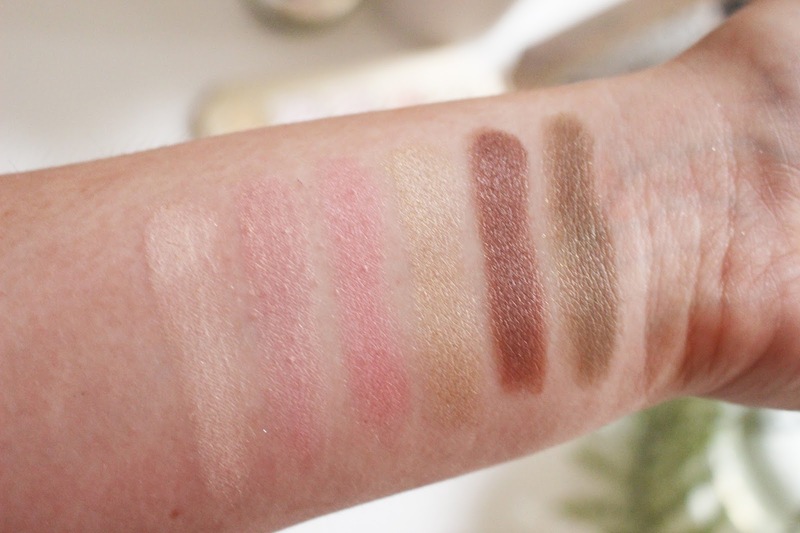 If you do own any of the previous Natural Eyes palettes then you will spot some familiar shades; Nudie, Heaven, Push-Up, Chocolate Martini and Honey Pot can all be found in the Natural Eyes palette (which is also a great alternative if you don't want to buy such a large and expensive palette). However, I would 100% recommend this palette if you were thinking of buying one of the older Natural Eyes palettes as you get so many beautiful shades in this one palette. When I first saw this palette, I was instantly drawn to the colour selection, they really are for us makeup lovers who love a natural eye look. There is a selection of beautiful shades ranging from soft pinks, warm peaches, milky chocolate browns, rose golds and golden bronzes. There is not one shade that I would not personally wear, which is often not the case when I buy an eyeshadow palette. I bet if you looked at your eyeshadow palettes right now you would not find many where you would wear every single shade. I always hate it when brands will just throw in a bright blue or green into a warm bronze, peach and copper palette because it just does not work with the rest of the palette. 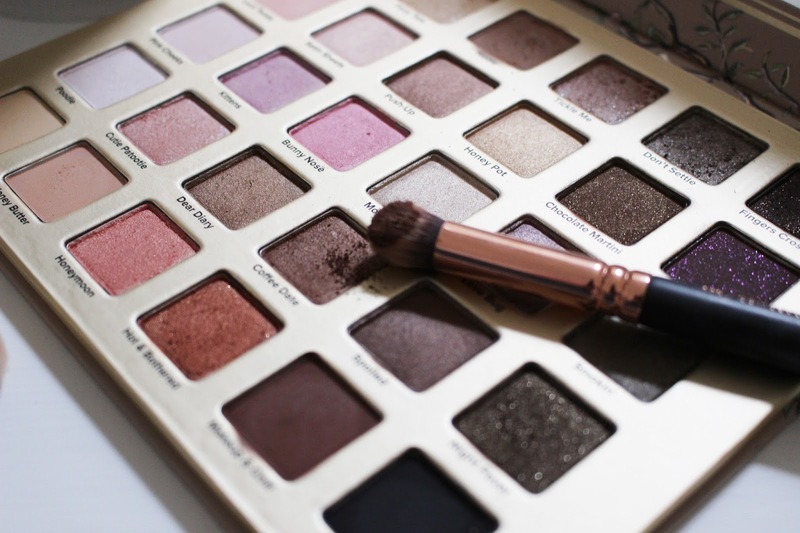 Whereas, with this palette all the shades work well with each other and is full of soft creamy shades which can be intensified with the use of dark chocolate browns and rich bronze shades. 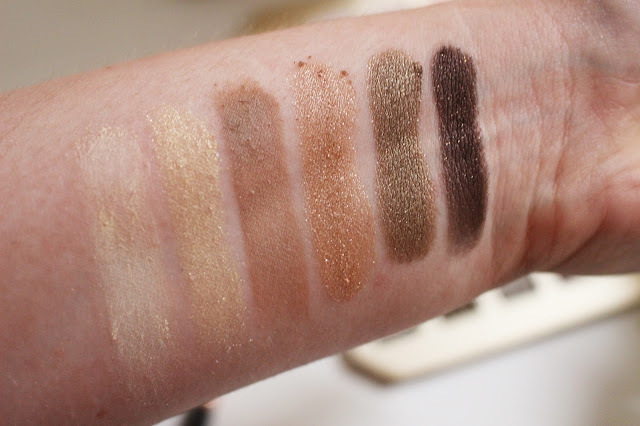 These shades are just stunning and all of them are such wearable colours for every skin tone. Not only that, I love the fact that here is a mixture of matte, shimmer and sparkle finishes to the shadows (but it is predominantly filled with shimmer shadows). If you are not a fan of shimmer shades then this is not the palette for you as there are only 7 matte shades. You can create so many looks with this one palette and I love the fact that you can create a whole look with just this one palette, and you don't have to rely on using other palettes from your collection. Usually I find with some palettes that there are no transition or crease shades and sometimes the shades used just don't work well with each other. 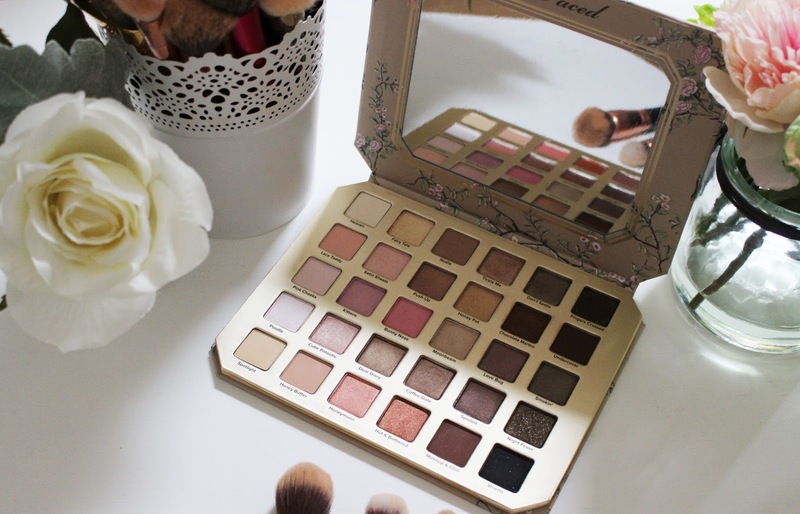 Whereas, with this palette you have everything you need to create a beautiful look. 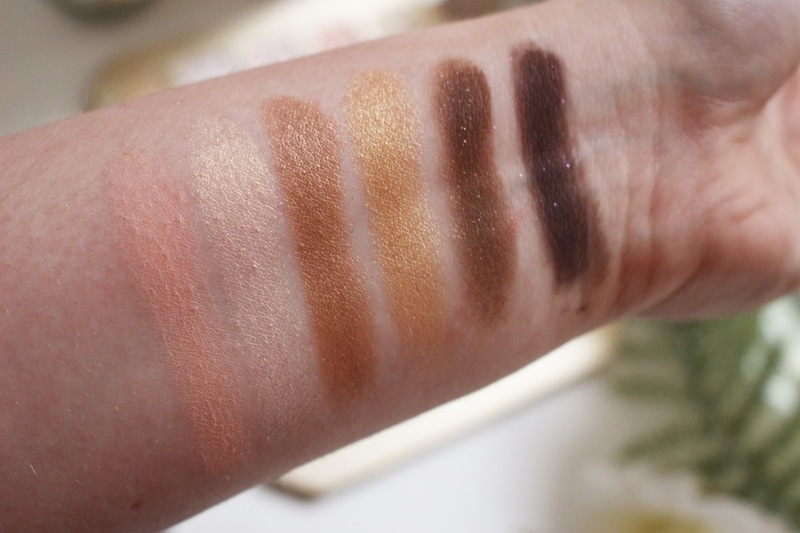 Nudie and Honey Butter are my favourite shades to use as a transition/crease shade as they are beautiful taupe/caramel shades that are great for that transition colour. Then you have a variety of shimmer shades that can help transform a look from day to night, but the shimmers are so beautiful that they can be worn throughout the day as well. All of these shades will work well on you no matte what skin tone you have and some of the shimmer shades can be used as a highlighter, especially if you have fair to medium skin! 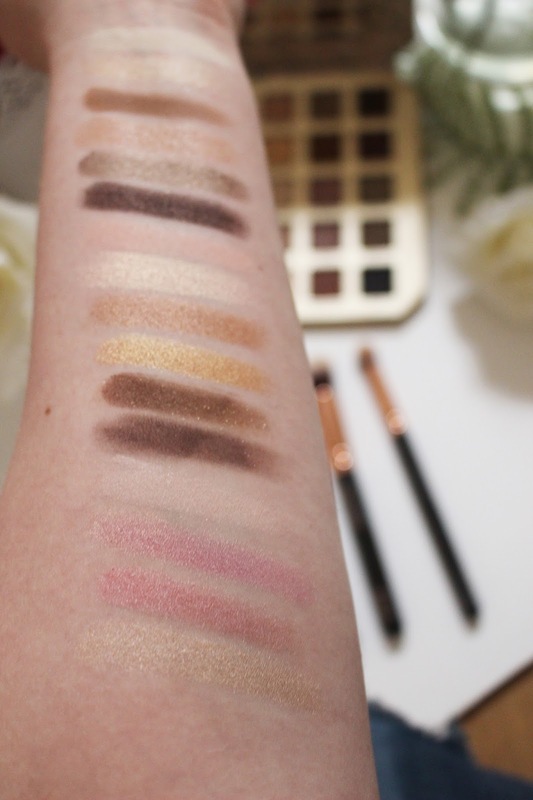 Pigmentation is something that I always look for when it comes to a good eyeshadow palette and the pigmentation of these eyeshadows are "out of this world," especially the shimmer shades. The shadows are so rich and have an amazing colour payoff (yes, there are a couple of shades that are quite pale like Heaven which is a cream matte shade but it is great for setting eye primer or concealer before applying the rest of your shadows). The shimmer shades are just beautiful and glide onto the eyelid like butter and just help to transform your look completely. But what I was really surprised about was how pigmented the matte eyeshadows were. I know there are only 7 matte shades in the whole palette, but they are truly pigmented and work so well as transition shades and to help intensify a look, especially the shade Makeup & Chill. In some palettes, the one thing that lets it down are the matte shadows as they are harder to make more pigmented, in comparison to shimmer shadows, but this is definitely not the case here - you could definitely create a beautiful look with just the matte shadows. The shadows build up, so if you are not happy with the shade or have applied a thin layer of shadow then you can easily build it up to create your desired look - you will definitely have to build up the shade Stiletto but when it is built up it looks amazing. They all last a really long time on the eye and the shimmer shades look just as amazing at the end of the night as they did when I first applied them. If you want to intensify the shimmer shades even more I would suggest using MAC Fix + which transforms the shimmers into liquid gold that look beautiful on the eye. Some of the shades do need MAC Fix + with every use because a couple are slightly chalky and don't have as much pigmentation as the others. I love how these shadows are so easy to blend and they just blend with each other so seamlessly - you don't have to be a makeup expert to get a stunning result with your blending. As you are getting 30 eyeshadows in this palette, it is of course going to be more expensive than the other Too Faced palettes and this does retail for £52, which is of course expensive for a lot of people. However, if you think of it like this, building your own custom palette would cost so much more. I know when I created my makeup Geek custom 9 eyeshadow palette, it cost me £72 in total and if you bought 30 Makeup Geek shadows (at £5 a pan, which is the price they are retailing for on BeautyBay at the moment) it would cost you around £150, not including the price of the magnetic palette. Therefore, this palette is totally justifiable and is amazing especially if you love your natural eyeshadows! WHAT I DISLIKE ABOUT THIS PALETTE? Firstly, the size of the palette is quite large (which you can understand as it does hold 30 eyeshadows). Therefore, it would be quite difficult to take with me when I am travelling as it won't fit in any of my makeup bags. 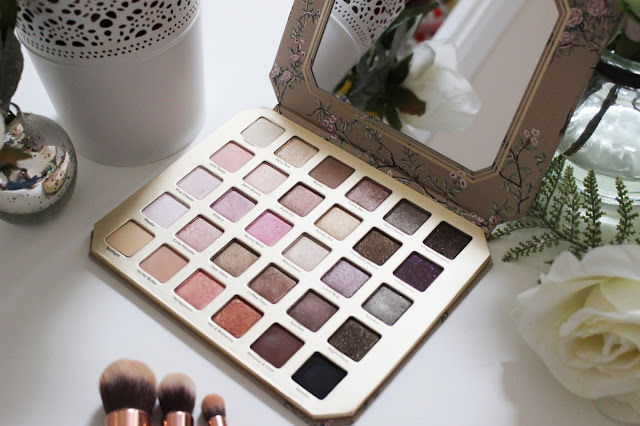 However, I am determined to take this with me when I go away because I know this is the only palette I will want to use when I am on holiday - as I usually go for a more relaxed and natural makeup look when I am away, therefore I am going to have to just buy a larger makeup bag to take this with me. This will take up a lot of room if you do take it travelling but the size of the pans and the amount of shadows you get will definitely redeem the fact that this is a large palette (although there are palettes that are even more impractical and luckily this palette is not too bulky)! This is not a big concern, but it is something to consider if you were thinking of taking it away travelling or if you are thinking of where to store it (as not everyone will have the Ikea Alex drawers to store all of their makeup)! Secondly, I had some issues with some of the shades themselves. In general, a majority of the shadows in this palette are amazing, but there will always be a couple of shadows that are not up to the same quality and unfortunately that is the case with this palette. I found that the shade Stiletto is not as pigmented and intense as I had hoped. Black eyeshadows are always so difficult to make really pigmented and unfortunately with this shade it is not that great. You can build this shade up but I found you have to build it up quite a bit, but if you can spend a bit more time building up the shadow it can look really good. There were also some shades that seemed to have a different formula, in comparison to the other shimmer shades, and they seemed to have more of a glitter formula to them. When they were swatched with a finger they looked good but when I used a brush to apply them they just did not perform as well as the other shades. The shades I found this with were Fairy Tale, Tickle Me and Night Fever. However, I did find that using MAC Fix + completely rectified the lack of pigmentation I found with these shadows. They were just completely transformed from being quite chalky into a beautiful shimmer shade. If you don't use MAC Fix + you will get quite a bit of fallout as well, but that can easily be cleaned up but the pigmentation is just not there with these shades unless you use MAC Fix +. There are some beautiful shades in this palette that I just love and all of these shades are so wearable and can be worn by every skin tone. Even the lighter shades still show up pretty well on the skin and they just look stunning on the eye. 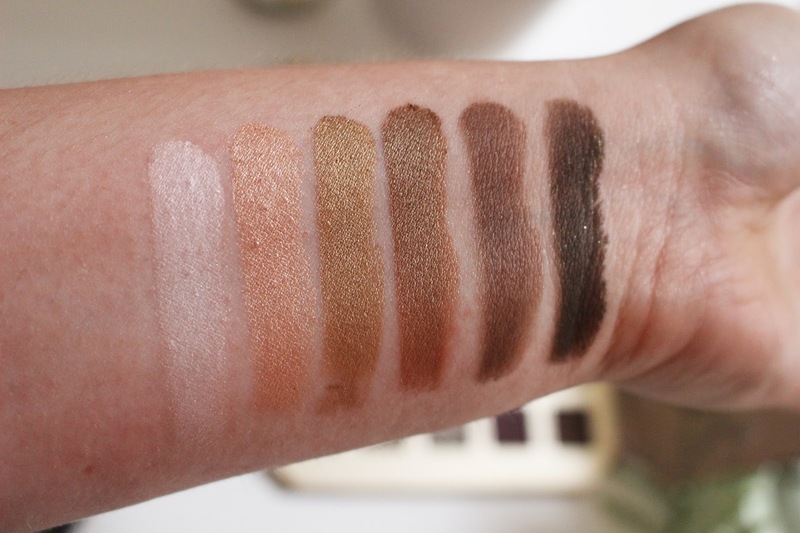 Some of the shades are very similar to each other, which is something that I am not keen on but you can see that there are subtle differences between every shade, whether it is the undertone of the shade or the colour of the shimmer that has been used in the eyeshadow. NUDIE - A beautiful taupe matte shade that works amazingly well in the crease as a transition shade. This is slightly more cool toned in comparison to the other transition shade in the palette, but it works so well with all the eyeshadows and looks greats smoked out in the crease. CUTIE PATOOTIE - Probably my favourite named shadows out of the whole palette, this is a stunning pink champagne shimmer shade that looks beautiful all over the lid but would also work well as a highlighter. It reminds me a lot of the shade Kitty Kat from the Anastasia Beverly Hills and Nicole Guerriero Glow Kit. HONEY BUTTER - The other transition shade in the palette, which is a beautiful matte warm caramel shade. This is stunning just run through the crease with Makeup & Chill in the outer corner to create a glamorous yet simple makeup look. MOONBEAM - Probably my favourite eyeshadow out of the whole palette, this is a beautiful champagne gold shade with a hint of silver. This is a shimmer shade and not only looks great all over the lid but works well as a brow and inner corner highlight. It would also work really well as a highlight on the cheeks if you are quite fair in skin tone. TICKLE ME - Tickle Me is a beautiful taupe/mushroom bronze shade with a shimmer finish. This looks beautiful all over the eyelid and I will often wear it with either Nudie or Honey Butter run through the crease to give me a quick and easy look that is just stunning. It is a shadow that I have to use MAC Fix + with and there is some fallout but the shade is just stunning and will look great on all skin tones. MAKEUP & CHILL - This is a beautiful rich dark chocolate brown that is perfect for making any neutral makeup look transform into a smokey eye. There is a slight reddish undertone which just makes this colour even more beautiful on the outer corner of the eye as it is not a dark chocolate brown. I will usually blend this into the crease as well to complete the whole look. You can create so many different looks with this palette and it is all about having some fun and just trying different combinations to see if they work. I love this palette and I know there are so many other looks I can create with just this one palette. IS IT A MUST-HAVE OR A MISS? In summary, this palette is a must-have, especially if you are a fan of natural eyeshadow palettes. There are no really bold or bright shades that can only be worn if you love bright eyeshadows or for Halloween. There is a stunning mixture of wearable rose golds, pinks, bronzes, coppers and golds which just help to create a natural and minimal makeup look. If you do prefer to wear brighter shades then this will probably be a miss for you as you would only wear a few shades, however if you are wanting a more neutral palette that can be worn for a special occasion or on an everyday basis then this is the one for you. Also if you are not a fan of shimmer and glitter shades then this palette will probably also be a miss as this is jam-packed full of shimmer eyeshadows. 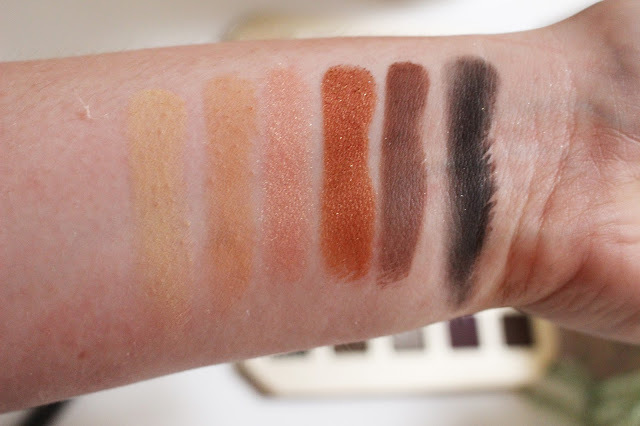 There are only 7 matte shades and if you are wanting an all matte natural eyeshadow palette then I would recommend the Urban Decay Naked Ultimate Basics Palette (which I reviewed here). I think this palette is totally worth the price and it really does just depend on your preferences when it comes to eyeshadows. 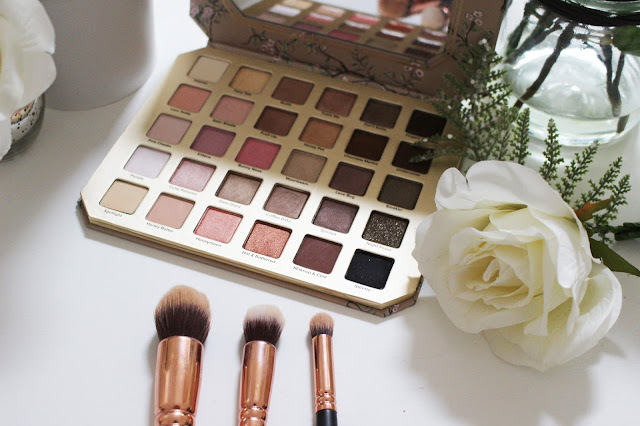 If you love neutral shades and shimmer shadows then this will be your favourite palette of all time, if that is not for you then I would recommend another palette. The shadows are amazing quality, highly pigmented and blend like a dream. I would definitely get your hands on this before it is gone! 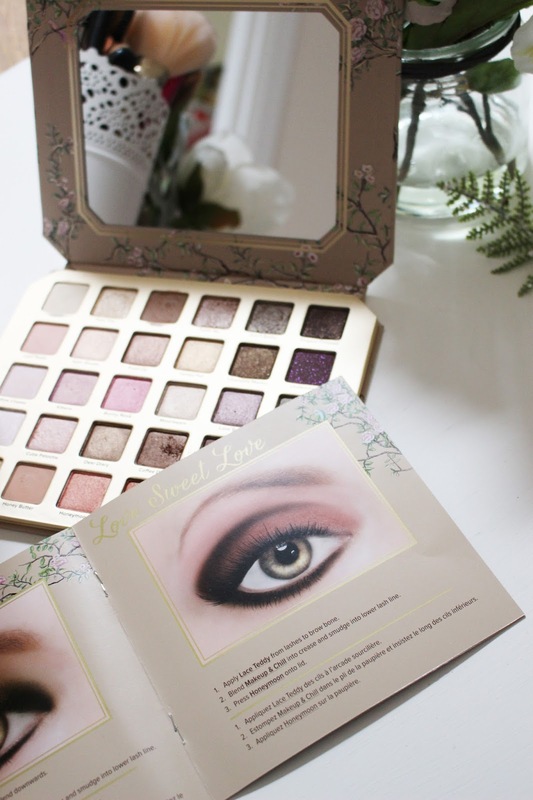 The Natural Love eyeshadow palette is available for £52 or $59 and can be purchased from the Too Faced Website, Debenhams and Sephora. I would love to know if you have the Natural Love palette and what you're thoughts are of the palette? What other Too Faced products do you recommend and let me know what other Too Faced products you want me to review next!